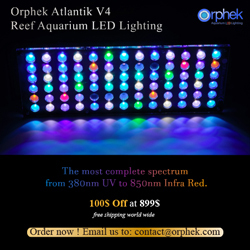 If you’ve been holding off on upgrading the lighting scheme over your aquarium, here’s a great opportunity to save a few bucks. EcoTech Marine is allowing various online vendors to sell their Radion XR30w and XR30w Pro LED fixtures at discounted prices. Normally, EcoTech employs a minimum advertised price (MAP) campaign that forces all retailers to sell their products at the same price, regardless of whether the store is online only or a brick-and-mortar. So, we were pleasantly surprised to see this price drop. Unfortunately, it won’t last forever. There’s no word on when it will end, but it has been going on for a couple of weeks now, and who knows when the prices will return to normal. The price drops on the XR30w and XR30w Pro are $100 and $150, respectively. If you’re looking to buy the fixture at the discounted rate, we recommend hitting up Bulk Reef Supply, who seems to be the most vocal about the sale, or our friends at Aquarium Specialty . Both companies offer a pionts based rewards program, so it’s a win win either way.